These recipes were learned from an Sardenian/Italian cheesemaker with years of expertise (I wwoofed on his farm in the heel of the boot of Italy). 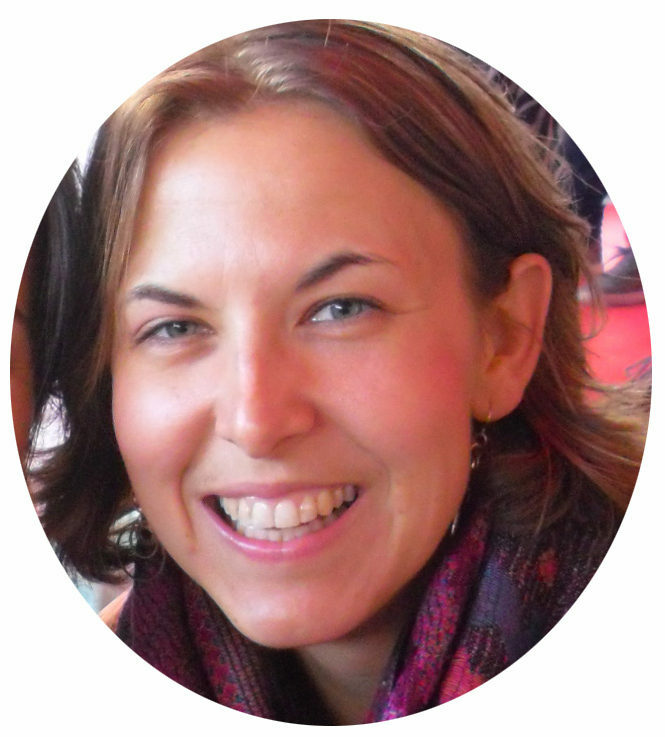 So much of cheesemaking is about “feel” and subtleties, but here are the objective steps. One batch of milk, two temperatures, three mold pressures, four different cheeses! Formaggio Primo Sale (FPS): “Cheese Before It’s Salted” – a tasty soft cheese not meant to be aged. Pecorino Duro (PD): “Hard Sheep Cheese” – a hardened, aged verson of PS, meant to be grated into pastas, etc. 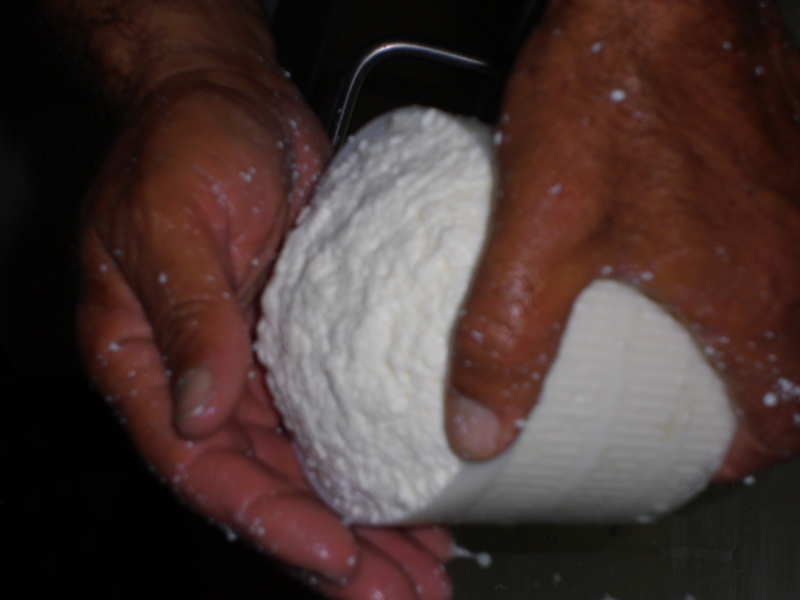 Ricotta Fresca (RF): “Fresh ReCooked” – a very soft cheese meant to be eaten within a day or two. Kilos and kilos of cheese heaven at various stages of aging. Traditionally, these cheeses were made only when the outdoor temps would keep them cool. Now, it’s possible to make them year-round, but this farm sticks to traditional ways. In the winter, the cheese-making milk is heated twice. As I understand it, different proteins and fats react at different temperatures. 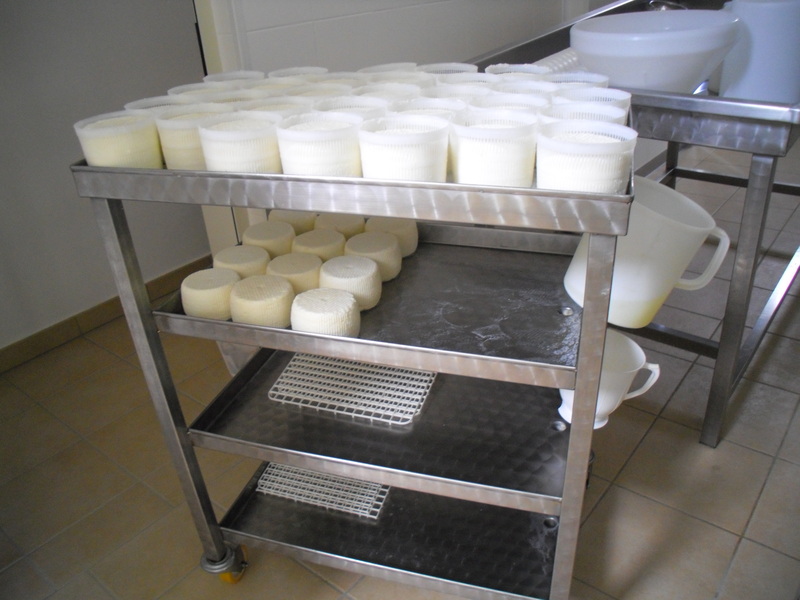 First the milk is heated to a low temperature, rennet is added, and the curds are either pressed gently into molds (FPS), or firmly into molds (PS, PD). Then the remaining whey is heated again to a much higher temperature, new curds form, and these are gently drained in molds (RF). Filter raw milk twice through cheesecloth. Heat milk to a minimum of 36°C (97°F), and absolutely no more than 40°C (104°F), in a stainless steel pot. Add two capfuls of rennet (about two teaspoons), stir, cover, and wait 30-45 minutes to allow curds to form. Cut the curds with a knife in a cross-hatch pattern (several parallel cuts in one direction, followed by several perpendicular cuts). Stir the curds quickly and vigorously, breaking them into very small pieces. Prepare a space where your curds can drain. It is important to catch all the whey that drains off the cheese. The rolling cart where cheese is left to drain for a few days. On the top level in the plastic baskets, you can see the cheese we just made. On the middle level is cheese from the previous day that has been removed from the basket mold, turned, and salted. On the bottom are the plastic racks that the plastic baskets sit on during their first day of draining. On the left edge of the cart you can see the two plastic buckets catching the drained whey. (Note: this is not the whey used for ricotta production. In this case it is a mess prevention strategy. Submerge a mold basket into the curds. 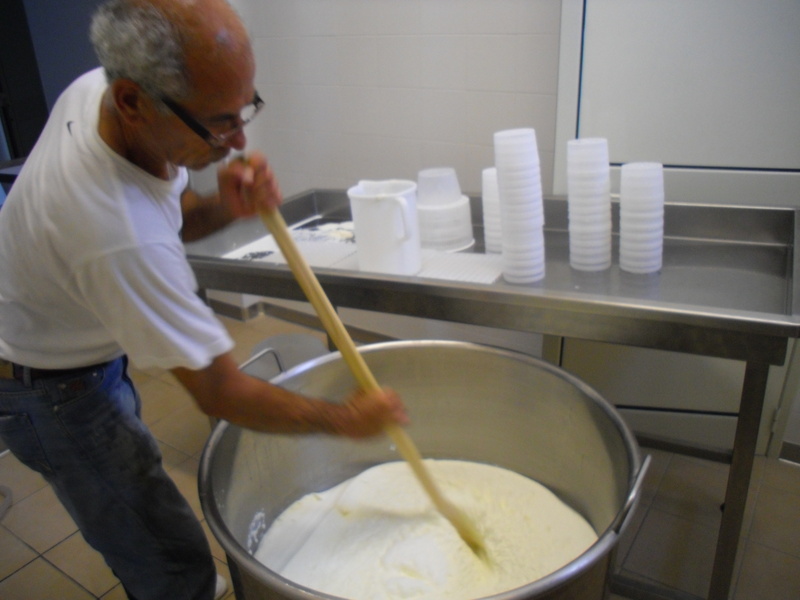 Slowly and gently scoop the curds into the basket, ensuring as much whey as possible remains distributed throughout the curds. (This is supposedly the secret to a wonderful, soft texture.) Make sure to flatten off the top for a symmetrical cheese that drains well. Transfer the mold basket to a surface where it can continue to drain. Don’t forget – catch the whey that drains off! After ten minutes, gently dump the formed cheese into the palm of your hand, flip it over, and place it back in the basket (upside down). Continue to drain. Leave to drain overnight at room temperature. The following day, you can remove the cheese from the mold and eat it. If you like, you can rub the outside with coarse salt for flavor. If you are not going to eat the cheese right away, refrigerate it, ideally turning every day. The cheesemaker stirring the curds with a giant, wooden paddle. 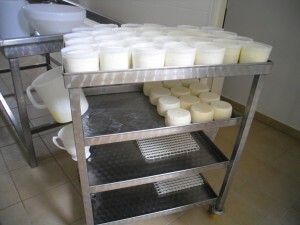 In the background are some of our cheese making supplies – plastic basket molds. Scoop the curds into a basket mold. Pack the curds down firmly with your fingers. Add more curds, packing until the basket if full and the top of the cheese is flat. After ten minutes, gently dump the formed cheese into the palm of your hand, flip it over, and place it back in the basket (upside down). With your fingers, break up the curds and repack them down hard again. Continue to drain. The following day, remove the cheese from the mold. Before turning it, rub the outside with coarse salt. It is my understanding that this is a catalyst for the aging process. I’m told you can also soak the cheese in salt water. Place the cheese upside down and allow it to drain another day. On the third day, flip the cheese and transfer to a 14°C (57°F) cellar. Any warmer, and the cheese will age (ferment) too quickly. The over-activity of the organisms will crack the cheese. Any cooler, and the aging process will stall. On the fourth day flip the cheese. On the fifth day flip the cheese. And so on for up to a year for Pecorino Stagionato (remember, it is getting harder every day, so after a month it’s up to you when you want to eat it). For Pecorino Duro, age from six months onward. Blue mold will likely grow on the rind of the cheese. Before eating, simply scrub it with a brush under running water. If you don’t have time to make Ricotta the same day that you make FPS and/or PS/PD, refrigerate the whey overnight. Filter the whey before heating – a standard, mesh kitchen strainer will do. Obviously the smaller weave the better. Heat the whey to 85°C (185°F) in a stainless steel pot. At 60°C (140°F), add a handful of salt. Once the whey has reached 85°C (185°F), remove from heat. To increase the ultimate volume, you can add 2L of milk at this point. It isn’t necessary, but it will double the amount of Ricotta Fresca produced. Cover and let sit for 30-45 minutes. Stir curds gently and slowly to keep cheese soft. Drain and enjoy! (Or place in container for later use). One batch of milk, one temperature, one mold pressure, one cheese! Cacioricotta: “Cheese cooked” – a semi-hard, slightly sweet cheese. Traditionally, this process was used to make cheese in summer, because the result kept well without refrigeration. If you have a fridge, extend the cheese’s life by keeping it chilled. In the summer, the cheese-making milk is heated once to a high temperature. 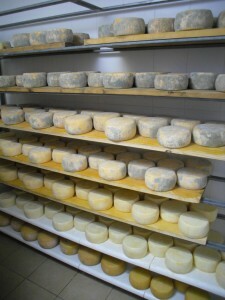 When it cools to “warm,” rennet is added, and the curds are pressed gently into molds. 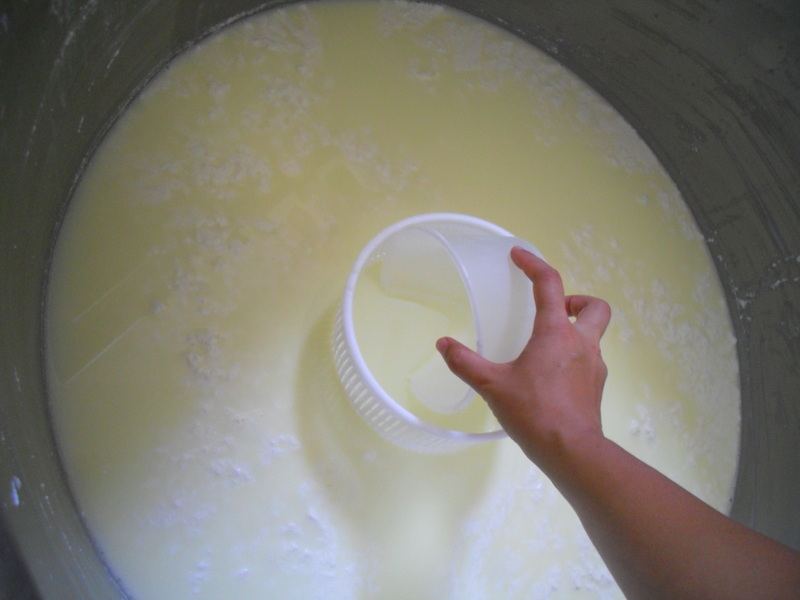 Draining the whey out of the curds using a scoop and a plastic basket mold submerged in the curds and whey. Heat milk to 92°C (198°F) in a stainless steel pot. Cool milk to between 43-45°C (108-113°F). Using the bottom of a strainer, skim the flimsy, puffy, bubbly stuff off the top of the curds and discard. Stir curds to break into small bits. 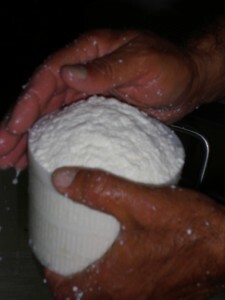 Gently turn curds by hand to get curds to settle and separate from whey. Drain enough whey to make collecting curds easy. (Like drinking enough milk out of your cereal bowl to get at the remaining cereal…) Tip: submerge a strainer or mold basket and scoop the whey from the center of the strainer. The master at work – gently but firmly forming up some delicious Cacioricotta. Gently scoop curds into a basket mold, using even but light pressure to form a dome on the top of each one. Rotate the mold as you work to ensure even texture. Transfer the mold basket to a surface where it can continue to drain. On the third day, flip the cheese and transfer to a 14°C (57°F) cellar. On the fourth day flip the cheese. On the fifth day flip the cheese. And so on. I’m told you can eat it until the cheese becomes too hard, at which time you can grate it into pasta! So, there you have it: how to make cheese from sheep’s milk! May you enjoy years of delicious, amazing cheese! I’m milking a sheep but overtime I try to make cheese once I add the rennet it starts sticking together. I’ve tried adding less and less. What am I doing wrong? I’m not sure I understand your question? 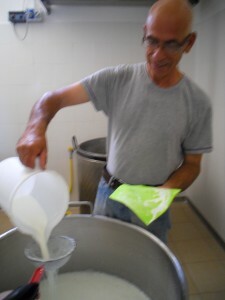 Rennet is meant to make the non-whey parts of the milk coagulate. That’s how you form curds for cheese! (The curds are then pressed into a mold and left to harden.) So you must be asking something else? Hello, I am making some cheese from your recipes tomorrow, I am currently milking 2 sheep at my home in New Zealand. I am wondering if it is acceptable to pasteurize the milk first or does this have a negative impact upon the cheese? Hi Edwin – Sorry for the response delay. I’ve been away from the internet for several weeks. Many cheese makers I know do not pasteurize their milk for several reasons, partly having to do with health (they believe unpasteurized is healthier) and partly having to do with cheese texture and what happens to proteins at different temperatures. Seems like I might be too late, but that’s what I can tell you off the cuff. I am hand milking a ewe at the moment. Looking at these receipes it looks hard to do. what is the function of calcium chloride when making cheese from sheep milk? Does the capital L stand for liters? Can you tell me how much rennet should be added to 2 gallons of sheeps’ milk? I know it doesn’t take very much. Is lemon juice just as good? One of the recipes I’ve read mentions using cheese culture? What exactly is cheese culture? We hope to demonstrate how to make a crumbly cheese something in the realm of feta. We will put it on home made pizzas. We have a small sheep farm and run a summer camp for children ages 9 – 12 yrs.. We run the camp for the benefit of our local watershed, Raritan Headwaters Association, in Morris, Somerset and Hunterdon Counties, New Jersey. Yes, capital L = liter/litre. I don’t have the rennet answer for you for 2 gallons – sorry! You need about 1 tsp for 7 gallons, so it would be a pretty small amount of rennet for 2 gallons. I can’t answer for sure about lemon juice, but I think it is not as good. However, if you are going for something crumbly like feta, it might work. More research or call a cheesemaking place, maybe? Cheese culture is usually a bacterial inoculation that results in a specific flavor. Hi, we currently live in Tuscany Italy. Last week we made Pecorino with a great friend using raw sheep’s milk. The cheese is in our cantina. It looks great but now it is starting to crack. The cantina temp is 16c and humidity is 60%, is it too dry? Should I rub them down with olive oil? Should I turn off the dehumidifier? Hi Giacomo! Cracking cheese is almost certainly low humidity. This site has a few good ideas beyond turning off your dehumidifier. (Can store the cheese in a container with a wet paper towel to reduce air around it, etc.) Hope that helps! What do you filter the milk with and what is a plastic mold? Are they standard cheese making molds? Hi Emily! The milk was filtered twice through a cheesecloth, then once through a metal mesh strainer with a very tight weave. We used basket molds with lots of holes – like #6 and #11 pictured here. This mold is what I’d buy if I were going to give this a try at home. Thanks, I’m looking into doing WWOOF this fall in a FARM in South France and your information is very motivational. Hope my experience is as nice.